Released in March, Apple Configurator was created as an answer to the iPad and iPhone's success as enterprise solutions and helps organizations prepare, supervise and assign a multitude of devices to its workforce. The 1.0.1 update brings a host of minor tweaks like erasing iBooks and iTunes U bookmarks upon the return of a device, as well as fixes for displaying information and importing .ipa enterprise apps. Redemption codes for multi-use licenses has received a major overhaul to reflect Apple's app recycling policies. 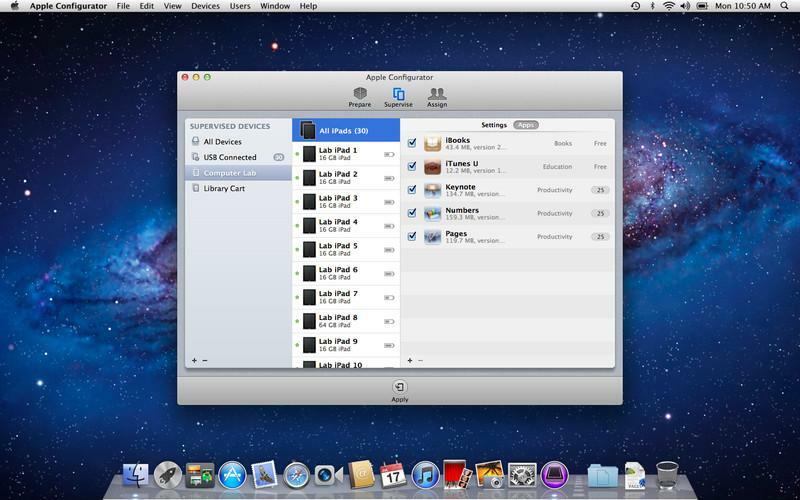 When Apple Configurator was first released, it would treat redemption codes on what was basically a one-time-use model. Once a code was used to install an app onto one device, its licensing would essentially terminate. This allowed for only one device to use a given code which would not reset even if the app was erased by the configurator. In the updated version, redemption codes can be reused if the device that originally downloaded the app is erased by Apple Configurator.  Enterprise apps packaged as .ipa files are imported and installed correctly.  Redemption codes for apps that contain a comma in their title can now be imported.  A redemption code may be reused to install an app on another device if the original device is unsupervised and erased by Apple Configurator, or if the app's installation did not complete on the original device.  The redemption code used to purchase an app in iTunes may also be used to install the app on one device with Apple Configurator.  The number of redemption codes remaining for an app is now displayed correctly.  Notes and bookmarks entered into iBooks and iTunes U are deleted when a backup is restored to a supervised device.  The WPA2 password is saved when editing a Wi-Fi profile payload.  The name of a stored backup is saved when edited.  The storage capacity of an 8GB iPod touch is now displayed correctly. Apple Configurator 1.0.1 can be downloaded through iTunes and weighs in at 16MB. More information can be found on Apple's Support Pages.